“Why does the system we have fail so many people? How can we make it better?” Mr. Kimel, Posted January 7, 2018 6:46 pm . Convert those that maintain allegiance to the “individualism” religion that it isn’t in their best overall interests. Good luck. The answer to your “mystery” is quite simple. 2013 was pre-Obamacare and 2017 is post-Obamacare. The insurers aren’t insuring the same people. In 2013 insurers could select who they wanted to insure based on heath status and pre-existing conditions. Now they can no longer do that. Many of the people added to the insurance rolls are those who previously were rejected from buying insurance because of high health costs or could not afford the very high premiums for high risk coverage. 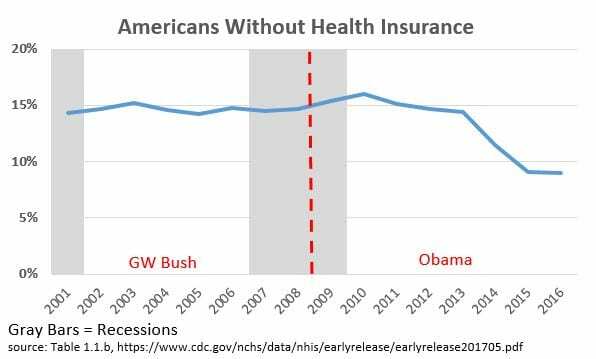 So, yes, pre-Obamacare insurance was cheap for those who could get it and were healthy. For many others is wasn’t available at any price. So there isn’t any mystery. You aren’t talking about the same insurance populations in 2013 and 2017. The designers of the ACA knew that adding sick people to insurance roles would increase the average premium, but that is why they also included subsidies (and the taxes to pay for them). Most people buying exchange policies are receiving subsidies. So what you really want to compare is actual customer prices, not unsubsidized list prices. Many people in 2017 are getting insurance for lower prices than your 2013 prices. By the way, that HHS document is obviously a political document pushed through by the Trump administration to bolster their attempt at Obamacare repeal. It is designed to appeal to the less informed such as Kimel with “truthy”, but highly misleading information. The real mystery is why Kimel keeps falling down the alt-right sewer hole, being sucked in by right-wing anti-Obama propaganda. He never did apologize for calling Obamacare a con-job due to his own ignorance. And he’s right back here again with another go at it. If you want to see the real change in premiums, look at the employer health insurance market. This has is a very steady, uniform population that did not change as a result of Obamacare. About half of people get their insurance through their employer. Compared to the five years before Obamacare to the five years after Obamacare, the annual growth rate of premiums slowed from 4.7% to 3.8%, fulfilling the promise of lower premiums. You would see the same reductions in the individual market, except the individual market is masked by a change in the insured population. You would think you would catch on. It’s the same error you made in your last post, comparing apples and oranges. Second, I would guess that the newly insured individuals in the exchange also included many people who had previously decided that insurance at the 2013 prices was not worth obtaining. One assumes that group probably would have made the same decision wrt insurance that was twice as expensive as the insurance policies they had previously rejected but for the fact that it was now illegal to do so. It may just be my ignorance speaking, but the newly insured that have pre-existing conditions had to be pooled with someone. Were they only pooled with people who had previously turned down insurance, or were they also pooled with people who had previously had insurance? Again, I don’t know, but if the newly insured got pooled with the previously insured, why wouldn’t the premiums on the previously insured go up too? Finally, a personal observation… just from speaking with my circle of friends (who have always received health insruance through their employers) and from personal observation (again, employer provided health insurance) a regular complaint seems to be a) deductibles going up and b) options disappearing. A surprisingly large percentage of people I know went from multiple HMO and PPO options a few years ago to the choice of a single HMO and a single PPO for this year. A national survey of employer health benefits released Wednesday shows how much deductibles — the health-care costs that people must pay out of their own pockets before insurance kicks in — have shot up. In 2016, 4 in 5 workers had a deductible as part of their individual coverage, averaging $1,478. During the past five years, deductibles have grown 10 times as fast as inflation and nearly six times as fast as wages, according to the new report. Note that those are employer provided programs. Read what I wrote in commenting and go to the links I provided. Please!, get this man off this board. He is not even close to being a good poster, let alone an author. Well, at least he got one thing right. There are any number of posts I wrote in the last two years or more which would answer these questions. Some of you are two new, some find this boring, some find it complex, an some like Mike maybe missed it or ignored it. I will try to fill much of this in. 1. Part D has what they call a Reissuance and Risk Corridor Programs. What they do is subsidize insurers and it was established by a Republican legislature. The idea was that insurers in the beginning may get stuck with those who have higher drug costs or have a need later on for a more expensive drug Like I was on called Retuxin at $12,000/treatment. Next stop was something called NPlate at $5,000/pill. I have something called ITP and overnight my platelets disappear. One month in the hospital the last time. The Retuxin worked where the steroids and aload of platelets did not. The same was installed for the ACA except the wording was not clear enough in the Act. Then Senator Sessions wrote a letter to the GAO which basically said the HHS could not appropriate funds for the program. The Reps Upton and Kingston got together and inserted a short paragraph called section 227. Appropriations Panel Chairman Rep. Jack Kingston put the final nail in the coffin by inserting one sentence in Section 227 of the 2015 Appropriations Act (dated December 16, 2014) which escaped notice. In the 2015 Appropriations Act, the sentence inserted said no “other” funds in this bill could be used for Risk Corridor payments. 2. There is something called having “skin-in-the-game.” Congress felt that with all of this new insurance floating around people would over use it. So they isntalled the Cadillac Plan penalty which would tax companies which had really expensive plans. They have delayed this until 2020(?). In any case, deductibles started off at ~$6,000 for individuals and $12,000 for a family as the maximum out of pocket to be paid INLUDING Co-Pays. It had an inflation adder to it. $6,000 for an individual is a lot of money; but, it stll can be borrowed and it is far less than $100,000 for open heart. The insurance companies and the employers jumped on this and mae a slight tweak to the deductibles. You had to satisfy your deductible before you could enjoy the negotiated rate. The balance here is in premiums and deductible. A Silver and Gold plan may have higher premiums; but, your deductible is less. I do not think a lot of people knew how to figure it out , wen for the cheap premiums when they had more costs, and ended up paying the difference in deductibles. Congress should have made it the other way around and apply the negotiated rate first. Pay particular attention to the second half of Healthcare Costs and Its Drivers Today. 3. If you go here: The PPACA and the Uninsured, Sanders, and HRC You can see the numbers broken out for 2016 insured and uninsured. 4. There are two sections which covered CSR subsidies (1401) and premium subsidies (1402). 1401 or CSR subsidies is what was canceled by Trump. The increase in cost will be picked up in the 1402 premium subsidies. If the states applied this all to silver plans, the impact would be much lower Gold plans with lower deductibles and freebie Bronze plans for people <400% FPL. 5. The peole getting pimped by Trump is the individuals market >400% FPL. It is here the full burden of the premium increase will fall or on 9 million in the individuals market. Most of the new people insured by PPACA are either expanded Medicaid recipients or people on the exchanges who did have insurance before because it was too expensive. For them, insurance premiums are much lower than they were prior to PPACA. I know a few people in this category who would have been dead now, except for PPACA. I’m not surprised that the full cost of insurance has risen since insurers only covered low risk parties, that is, young people without existing problems. If you were older or had a health problem, it was either impossible to get a policy issued, let alone one at an affordable one. I know a few people in this category who now have insurance after years without it. As BillB noted, PPACA covers a different population. It includes a lot more sick people. Most of them could not afford coverage. Now they have it. They are not suddenly making a lot more money, so, for them, the price of insurance has dropped dramatically. I’m sure there are people who are paying more for their insurance, over and above the usual rising rate. They are the ones making too much for exchange subsidies and healthy enough to have gotten policies pre-PPACA. Also, that final Washington Post chart seems to be a straight line showing the increasing number of people facing higher deductibles. There was a slight kink in the line, but this trend seems to have been going on for years, like shrinking airlines seat pitch. Well, you are quite ignorant. That is clear. But the employer market shows that the cost curve has been bent, saving customers thousands of dollars. The individual market has seen the same reduction, but it is masked by the fact that they have enrolled a much more diverse and expensive population than they had previously. Cripes, could you be any more dense. Those are employers choosing to stiff their employees by shoving more of the costs onto their employees. Kimel. You know nothing about healthcare. You have shown no honest interest in learning about it. You just keep waving your right-wing talking points. Go back to your racist postings. At least you are an expert on that subject. Take some time and read the my comment to you. Then read the links I provided. There are no more “pre-existing conditions that an insurer can penalize a person for. They are all pooled together. The companies can charge 150% for smokers and up to 300% for the elderly if states allow it. The Risk Corridor program (the same as what is in Part D was killed by the Republicans in an attempt to bankrupt the ACA) is what covers any large amounts of people who might accumulate with one insurer. Lately, be polite. You may not like Mike or what he says; but, I ask you to be polite. But Democrats have had opportunities and failed too. Maybe we get more insured, but we get higher costs. This whole bending the cost curve is nonsense – I just had two posts where, in comments, everyone was berating me that I was wrong to expect the costs to decrease. With the Presidency, with a majority (sure, not fillibuster proof, but a majority) in Congress, and a mandate, they delivered a Rube Goldberg machine. And your response that businesses are screwing their employees because they can is rich when you call a person a racist for opposing a massive, completely uncontrolled increase in the labor supply which does nothing but increase the power of businesses over labor. That’s an internally consistent position only if you favor increasing the power of business over labor, or if you’re a saboteur. Thanks for the links. I have been going through them. I am sympathetic. I would like to see universal coverage. I would also like to see us spending less than 17% of GDP on healthcare. (Democrats used to care about the cost of healthcare when it was well below that level. What the heck happened?) Somehow, just about every other advanced country has managed to do it. 4. Congress seems to think they can harness “market forces” in an area that will never be a market because of insane information asymmetry problems – insurers don’t know in advance how sick patients really are and patients don’t know if what a doctor is recommending is the best or least expensive way to treat an issue. Personally, I don’t see a solution to this until the entire medical care system in the US fails and is rebuilt from the ground up. Even then I don’t think the “free market” fanatics will give up, they never do. Mike, you seem to have no idea why this “Rube Goldberg machine” was basically the only approach that could be passed — or that it is similar in structure (private entity insurers) to that of other countries with much lower costs and universal coverage. Two huge considerations were (1) the employer-provided insurance had a half-century head start and people who have it like it (and want it to be messed with as little as possible), and (2) we have a federal system and states have historically regulated the insurance business. “Medicare for All” — the only alternative — had no chance of passing because, among many reasons, there are hundreds of thousands of insurance company jobs in many states, which would make it impossible for many Democratic Senators who weren’t ready to retire to vote for it. You also seem to have little grasp of how much the Republican Party has been sabotaging the law by deliberately making it more expensive than it would have been had the law been allowed to operate according to its original plan. We don’t how costs would be if the states had all, with enthusiasm like Kentucky, established their own efficient exchanges; if millions of low-income people in Republican-dominated states had been allowed to go on Medicaid; if the the suspension of risk corridor payments had not happened and driven scores of new co-op insurance companies out of competition in the market; and if Trump and the Republican Congress had not been threatening to cut off premium and co-pay/deductible help for lower-income buyers on the exchanges. But we can be pretty sure they would be lower. The history is very complicated. When you don’t understand the basics of the subject, you have no business commenting on it at all, much less with the “gotcha” political slant you are giving it. We expect a lot better than this out of Angry Bear.